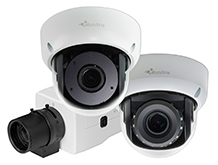 MILWAUKEE – (May 24, 2018) – Johnson Controls has announced the expansion of its highresolution IP camera portfolio with new models of Illustra Flex Mini-Domes and Box IP cameras in 4K resolution. These new cameras are designed to offer a high-image quality and feature rich surveillance option intended for a wide range of applications. The Flex 4K cameras provide increased detail and efficient bandwidth management technology for both indoor and outdoor models. The versatile Illustra Flex cameras feature effective bandwidth management technology and highly reliable and redundant recording features that ensure continuous and cost-efficient video streaming. Illustra® IntelliZip compression technology provides powerful dynamic bandwidth management beyond H.264 and H.265 to offset increased video storage requirements from high-resolution video recording. For crystal clear images day and night, the versatile Illustra Flex cameras are True Day/Night and feature True Wide Dynamic Range for balanced images in challenging lighting conditions. The affordable and compact Illustra Flex Box Camera is best suited for small to medium size offices, retail boutiques, schools, and bank branches looking for a cost-effective camera. The Flex Mini-Domes feature the same day/night capabilities, but also offer a P-Iris lens, which delivers clear video and improved depth of field in changing light. In addition, the outdoor Flex Mini-Dome features built-in IR illuminators to produce clear images at an effective distance in a variety of low light conditions. The Flex Mini-Domes and Box adhere to the rigorous security standards of the Tyco Cyber Protection Product Security Program. The holistic cyber approach begins at initial design concept, continues through product development, and is supported through deployment, including a rapid incident response to meet the comprehensive and evolving cybersecurity environments. For more information on the Illustra Flex 3MP and 8MP cameras, visit www.illustracameras.com.